There’s a term in there – “perservational bias” – that I hadn’t seen. I guess that shows how little archaeology I’ve studied. The idea: if a task uses tools that will decompose – anything with wooden baskets, or even a free-standing windmill – then it might fade away and disappear from the archaeological record. People digging through the strata later will find only durable tools – a stone arrowhead, for instance – and get a skewed impression of how people spent their time. Anyway, I thought this was interesting – modern archaeologists, given the biases present in their own societies, ascribed limited roles to prehistoric women. Waguespack wanted to address that bias, arguing that if women’s contribution to diet wasn’t needed, they probably still did *something* as opposed to sitting around twiddling their thumbs all day. Seems like a reasonable assumption, right? And I came across this article because I was trying to learn what percentage of people’s time was spent on food production through prehistory. That passage gave me a lot to think about. Many people participating in the modern economy of the United States feel a residual squeamishness because the distribution of capital in this country is deeply rooted in the history of slavery and genocide – if you buy a house, well, no one *made* the land it’s sitting on, so if you delve far enough back through time murder or the threat of violence was necessary for that piece of land to be claimed by someone, who then sold it to someone else, onward through time until it ended up with you. But I hadn’t previously considered the idea that *all* the trappings of modern culture – so much of it brought to us by discoveries rooted in the scientific method – is rooted in oppression. Early scientists were aristocrats: no one else had as much free time to pursue experiments. Which, right – most of the time accumulated mutations after a gene duplication event turn your new sequence into symbolic dreck – but, think, without the prior duplication, you would’ve even have the chance to try out that dreck. Mutations that reduce the function of a necessary gene, if there were only a single copy, would be selected against. The idea is that culture will also evolve, in a way similar to the evolution of genetic sequences. As long as a bit of culture is good at propagating itself – either a story that’s fun to hear, or fun to tell, or a piece of knowledge that helps its carrying people survive – it’ll pass through the ages. You might think of biblical proscriptions against certain foods. If those foods caused people to get sick, there’s a survival benefit to the meme’s carriers by propagating them, and they’re encased in the bible, which people enjoy reading from. Their very souls depend on it. But any scientific or technological discovery “evolves” similarly. The principles of mathematics, the scientific method, knowledge about electricity. As our knowledge is refined, in ways that make what we have to say more useful, it’s spread more widely … to the point that now 80% of the world’s population has access to electricity. But for that process to start, electricity has to be discovered in the first place. And that is what I see as the link between stratified oppression and gene duplication events. Once humans were living in agricultural societies, where there was a big benefit to ownership of capital (which, right – this claim can be contested. 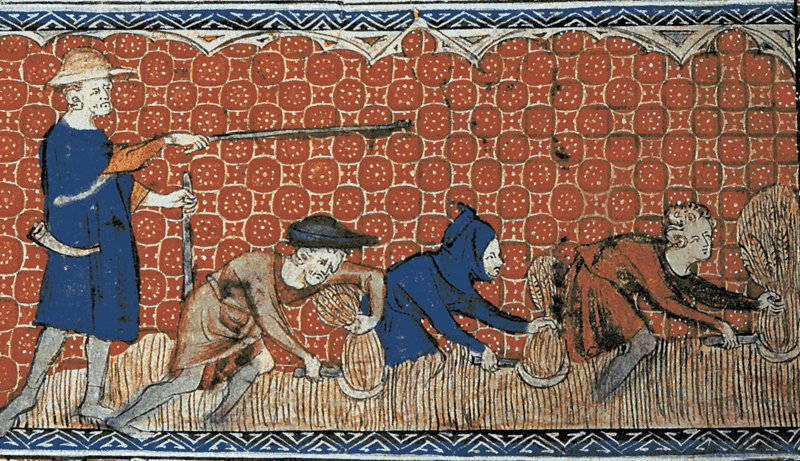 The whole idea that farming heralded the beginning of stratification and oppression. Heather Pringle wrote a nice article on the effect of staked claims in pre-agricultural societies – think, “This is my fishing rock… go sit somewhere else!” Or, “This is where I hunt for berries… in this here berry patch… go forage over there, in that rocky field!” But there isn’t any evidence that any pre-agricultural peoples attempted to build the type of long-ranging empire made possible by farming), by using violence or the threat thereof to claim ownership of land and tax the people working it, you create leisure time. Like a duplicated gene, the person who no longer needs to work for food is free to do something else. And I think the analogy goes farther. Most duplicated genes degenerate and produce nothing of value. And I personally imagine that most aristocrats through history were more the Caligula type – only drinking some wine, sleeping with some slaves, causing trouble – than the Ben Franklin type (who, uh, did other stuff too). But, because useful information spreads so rapidly, it took only a miniscule fraction of good ones to create our modern culture. “On the banks of that pond one ascetic was performing the most austere penances with his legs upwards and head downwards. There upon approaching him, Rama Said–O you of good vows, blessed are you; I do ask you, now, O you highly effulgent and grown old in asceticism, in what Varna you are born. I put this question out of curiosity. I am the son of king Dasaratha and my name is Rama. “For what are you going through such hard austerities? Is it heaven, or anything else that you pray for? O ascetic, I wish to hear, of the purpose for which you are performing such hard penances. Art you a Brahmana, or an irrepressible Ksatriya or the third caste Vaisyas or a Sudra? Do you speak the truth and you shall be crowned with auspiciousness. “Hearing the words of Rama, the ascetic, whose face was downwards, gave out his degraded birth and communicated to him for what he was performing ascetic observances. “Hearing the words of Rama of unwearied actions, the ascetic, with his face downwards, said. “O highly illustrious Rama, I am born in the race of Sudras; and with a view to reach the region of the celestials with my body I am going through these austere penances. “O Kakutstha, I shall never utter a falsehood since I am willing to conquer the region of gods. I am a Sudra and my name is Sambuka. Right? Very crumby. Dude is just trying to be good! But the king’s job was to ensure that oppressed people stay oppressed. And now I, sitting here typing on a laptop computer, surrounded by all the comforts of the modern world, am the disconcerted beneficiary. Excerpts from some other book: Volume 2. On how friends don’t let friends study alone.